After losing a memory card with the best pictures from a trip I took across the western USA, I decided to write a quick article on how to store memory cards and how not to lose photographs during long trips. It was a lesson learned the hard and painful way, so a couple of days after the loss, I came up with a plan to protect my data going forward and try not to lose it any more in the field. Below you will find my plan and my recommendations. Losing images from a long-planned and expensive trip can be very painful. After it happens, you realize that it is not the financial aspect of it, but the effort you put into creating those images instead that hurts the most. We as photographers have to work with the best light during the day, which happens at sunrise and sunset times, no matter where you are located. In Glacier National Park, the sunset times in summer can be as late as 10 PM and as early as 5 AM in the morning. Northern Canada and Alaska are even worse, with sunset times close to midnight in July and sunrise in less than 5 hours. Add +1 hour after sunset and -1 hour for sunrise to get back and to the location, and we are talking about less than 3 hours of sleep at night. In addition, those late hours are also the peak and active time for wildlife, making it dangerous to hike to get to a good spot. And I am not even talking about the weather, which can go against you in those twilight hours. In addition, you carry the heavy weight with you and spent a lot of time tweaking your equipment and composing your shots using different spots and angles. So with so much effort put into making those images, the last thing you want is to lose them. What’s worse is, if you have been shooting for a while, you know if you got a great photo right at the time you take it. You take a look at the camera LCD and you know it is a keeper, a potential for your showcase portfolio. Once you lose photographs, you start to remember those keepers and deep regret hurts even more. So, why even take the chance? Take all the steps you can to protect your photographs when traveling and working on the field. Whether you are a professional photographer or a photo enthusiast, it is critical to not only back up your existing data, but also the new data that has not hit your permanent storage yet. I always take my laptop with me and back up photos from memory cards on a daily basis. I did not take my laptop with me just once when space and weight were an issue, and of course, it was the time when I lost many “keepers” on a 16 GB compact flash card. It was painful to lose so many great images, but maybe it happened for the better – going forward, I will remember to always take a backup device with me. Now when I say “back up”, I do not mean back up photos and then delete them from memory cards. You should never keep data in a single location, because any data medium can fail. With hard drives, it is just a matter of time. So when I back up my photos, I keep the originals on memory cards, until I safely get back home. Only after copying all images to my home storage and backing them up, I then format the memory cards for my next assignments. Backing up your data on the field can be done in several different ways. If your camera is equipped with dual memory card slots (like Nikon D7000, D300s, D3, D3S, D3X), you can configure your DLSR to write to both cards simultaneously. While this means wasting one card, it is a good idea, because two cards will contain the same images. If data is corrupted on one card or one of the cards is lost, you still have a backup on the second one. Memory cards are cheap, so if you do not need the speed for video or fast action photography, get multiple slower cards that you can use in parallel. If your camera is not equipped with a dual memory card slot or if you want to still back up your data to a different location, another option is to use an external memory card reader with a hard drive. There are many different options available on the market with devices of different hard drives sizes and obviously the price also varies depending on size and features. Something like the Sanho Hyperdrive Backup, although expensive, would work great for this purpose. Backing up your photos to an external storage device is a good idea – what if you were to lose your camera, or if you dropped it somewhere you cannot recover from? And lastly, if you travel with a laptop, just backup your photos to your laptop’s hard drive. That way you do not need to worry about getting an external storage device. I typically label my memory cards and provide my contact information on the back of them. If your memory card does not have space to write on, just put some white tape on it (make sure to use thin tape and do not tape over contacts) and provide at least your phone number. If anybody finds your memory card, they will at least have your contact information to contact you. Keep your memory cards organized and store them properly in your camera bag. 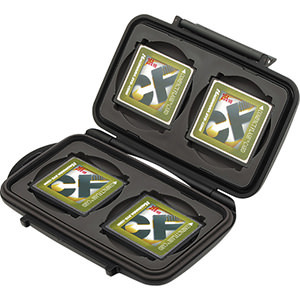 There are many different memory card holders out there, but the one I personally like and use is a Pelican brand CF Memory Card Case that securely holds 4 Compact Flash Cards. If you shoot with SD cards, you will want the Pelican 0910 SD Memory Card Case that can hold up to 8 SD and 16 Mini SD memory cards. This card case is water-resistant and well-protected against occasional abuse. If you have been storing your memory cards in camera bag pockets, I highly recommend getting one of these instead. I have four 16 GB SanDisk Extreme Pro cards stored in my Pelican case. When I lost one of my memory cards, it was because I temporarily put it into my pocket in rush. Storing memory cards in pockets or in camera bag pockets is not a good idea, since dirt, moisture and other factors could damage them. 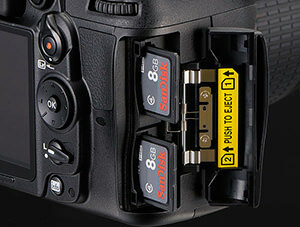 Dust can get into the holes in CF cards. If you only have one or two cards and do not want to purchase a card case, at least store the memory cards in plastic cases that came with the cards. When you are home and you are done using the memory cards, store them in dry, cool space (room temperature). I once formatted a used card with photos I needed, because I did not label or mark it after it was used. While you can recover photos from formatted cards, if you happen to write anything over the formatted card, the images you had before will not be recoverable, especially if you fill up the card with new images. You can purchase small color labels from any local store (for example green labels for formatted and red labels for used cards) or you can just come up with a smart method to identify used cards. Personally, I simply flip memory cards over in my memory card holder after they fill up and this way, I know that I will not be touching that card until I get home. If you have a habit of copying your images from your memory cards and forgetting to format the cards afterwards, I highly recommend to stop doing that and get in the habit of formatting memory cards in your camera instead. Formatting memory cards in your camera is very fast and with some cameras, you don’t even need to go to the camera menu to format images – on a Nikon DSLR for example, just holding two buttons with red labels and then pushing them again will format the memory card. It will usually take less time to format a memory card in a camera, than to deal with deleting each individual image on a computer. If you do not like an image, or if it comes out blurry, it is OK to delete that image, but don’t rush with the process – take your time to delete only the image you need to delete. On many cameras, if you don’t pay attention to prompts and go too fast, you could accidentally delete more than one image, which could be a problem if your earlier image was something you were happy with. I have had cases when I was shooting a wedding and I managed to delete more than what I needed to delete, just because I pressed buttons too fast. If you need to delete an image you are not happy with and you shoot something important, just do it later, when you have the time. Or better yet, you could do that during your image culling process. Great info… I’m so sorry for your loss :( Thanks for sharing with us! Your work is amazing. Thank for the tips, sorry that you learned these the hard way. The formatting in camera s a handy lesson especial, this may explain the occasional issues I have with images that wont import. I see you recommend a backup drive like the Hyperdrive. Is there no way to use the IPad you had as a backup device? Do you know of any tablet device that would work with a card reader (or direct cable from the camera) to backup a card? It seems these devices would be a better way as the big screen and capabilities of the tablets would make them ideal for editing as well in the field without a big laptop to carry. Thanks and hoping for a miracle that your lost card shows up. Oh Kasim, I can empathise with your loss but, as you say, something positive has come from that experience as in taking steps to ensure it won’t happen again. Do you ever use a portable HDD, as in the FreeCom Sport Tough Drive HDD? I found this Blog very informative and timely as the number of images stored on my computer increases daily. I have the Nikon D7000 so took extra interest with regards the dual memory card. I also took note of formatting the memory cards in camera – thanks for that information. Also of interest is the card carrier, the Pelican 0910 SD Memory Card Case, I must check that out. Once again, thanks for all your Blogs, Tips and most of all for the amazing images that continue to inspire me. I dont have any plastic case anymore. what I did , and I was googling to see what other people did, was to put into film paper, the one you use to wrap food. On a wax paper – from the kitchen again– you can make a little envelope and write the name of the sd card or the year on it. I have about 15 cards now – 32 & 64gb and will often take 10k+ photos in a travel trip over a couple of weeks. Have a dual D7200 so always run as backup and then once near full, flip one to locked and store. The second I backup onto an external hard drive via my Surface tablet (when will Apple put a USB port on their iPads??). I can then format the second and re-use. I then keep both backups in a separate spot when travelling (camera bag in sealed containers for cards & external drive in my case). May seem overkill but lost all photos when my hotel was broken into in Singapore & my case was stolen as my backups were in the same case. Also have had cards die for some reason (or partially die with a dead sector), so double back up works for me. Memory is cheap as Nasim says and since he wrote the article, is getting even cheaper. Another handy hint is buy quality cards. I bought Kingston when getting my first 32gb cards and have had 3 die on me. Scrapped them and moved to Sandisk (Extreme & Extreme Pro) – never had a problem since. Your tips for beginners is way over my head. I got a memory card case with card reader, never lose memory cards ever. I’m about to visit Australia and New Zealand, and I’m wondering if there are any back up storage devices that don’t require a computer/laptop. I only want to save the images on my memory cards. Is this possible? Thank you. hai its safe we put the memory card in dry box camera? The memory chips of the photographic instruments are slightly diffent in the manner so that the works function is also the little bit different and the image and video quality is very good in that case. So if you want to know more then contact Hp Support. , Diwali Status, Diwali Images for Whatsapp & Facebook, etc then you are at the right place. Thanks for the article. Its a good learning for handling the memory card and keeping it safe. In most of the cases, if we use our memory card after a very long time, we get all the data erased. Why does it happen and how can we prevent escape from it? Visit HP Printer Error Codes to keep your printer device error or issues free. For Micro SD Cards I created a 3,5 cm ball, that can hold up to 6 cards. The ball can get attached to a keyring or a bag. So the cards are well protected, and you have them always with you.